1862-63 Chalon Issue on Pelure Paper, Perf. 13 at Dunedin, Unwmkd. Joseph Hackmey, Spink Shreves, February 2009, lot 1291; with 1950 R.P.S.L. certificate. Scott No. 21a. Campbell Paterson No. A1g (W) $10,000 ($6,840). SG No. 90 £3,500 ($4,600). 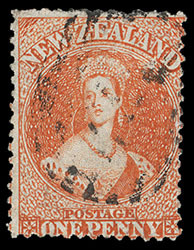 A CHOICE USED EXAMPLE OF THE RARE 1862 1D ORANGE VERMILION ON PELURE PAPER PERF 13 ISSUE. 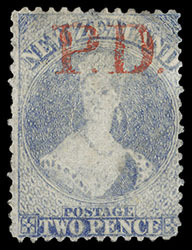 New Zealand, 1862 Queen Victoria "Chalon Head", 2d ultramarine on pelure paper, perf 13, unwatermarked, well centered with beautiful bright color, cancelled by red "P.D." handstamp; small thin spot at top, otherwise Very Fine and rare cancellation, Burrus Supplementary Material, Robson Lowe, 23 July 1963, lot 216. Scott No. 22a. Campbell Paterson No. A2f (Z). SG No. 91 £800 ($1,050). 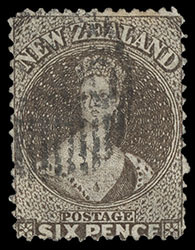 New Zealand, 1862 Queen Victoria "Chalon Head", 6d black brown on pelure paper, perf 13, unwatermarked, well centered, deep rich color with a strong impression, cancelled by barred oval; filled thin at bottom left, scarce and Very Fine appearance. Scott No. 24a. Campbell Paterson No. A5d (Y). SG No. 93 £400 ($530). 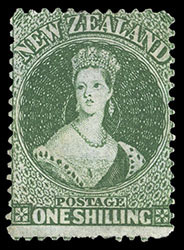 New Zealand, 1862 Queen Victoria "Chalon Head", 1s deep green on pelure paper, perf 13, unwatermarked, exceedingly well centered, strong color and sharp impression, fresh and Very Fine; signed Bloch, with 1980 Friedl certificate. Scott No. 25a. Campbell Paterson No. A6f (W). SG No. 94 £2,000 ($2,630). 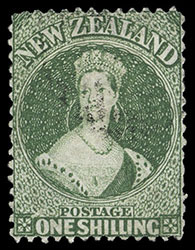 A CHOICE USED EXAMPLE OF THE RARE 1862 1S DEEP GREEN ON PELURE PAPER PERF 13.